Native to Australia and Tasmania, the eucalyptus, or “blue gum,” tree is now cultivated worldwide both as a commercial crop and for its ability to absorb water and dry up marshes. 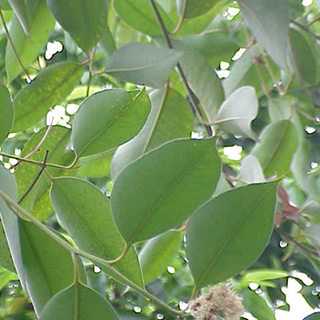 It is an important remedy among the Australian Aboriginals, although in medicine the essential oil is more commonly used, largely as an antiseptic. The steam arising from hot eucalyptus tea will quickly clear clogged sinus passages. Simmer 3–4 leaves per cup of water for 10 minutes in a covered pan and take 1/2–1 cup 3 times daily for the early stages of colds, chills, nasal catarrh, influenza, asthma, sinusitis, sore throats, and other respiratory disorders. Use 10 drops (1/2ml) of eucalyptus oil in 1fl oz (30ml) of almond oil as a chest rub for colds, bronchitis, asthma, and respiratory problems. Use 10 drops (1/2ml) of essential oil or 6 leaves in a bowl of boiling water as a steam inhalation for colds and chest infections. Soak a pad in a mixture of 10 drops of essential oil and 4fl oz (120ml) of water and apply to inflammations, painful joints, or minor burns. Prefers moisture-retentive soil that is neutral-to-slightly acid in a sunny site that is also sheltered from cold, dry winds. Sow the seeds at 70F (21C) in spring and grow until large enough to transplant into final positions, although buying young trees from a nursery is a quicker process. As the plant absorbs so much water, it can deplete the soil over a significant area. Gather the leaves as required throughout the year.